We have it all! From modern cabins to our 2-story Reunion Lodge plus family fun activities! 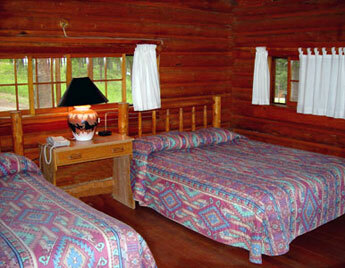 All of our rooms are in cabins with modern heating systems of quiet circulating hot water heat. Daytime temperatures typically run in the mid 70’s to low 80’s, nightly temperature lows run from the upper 30’s to mid 40’s. Each of our rooms have comfy pillow-top beds, private baths, and telephones. 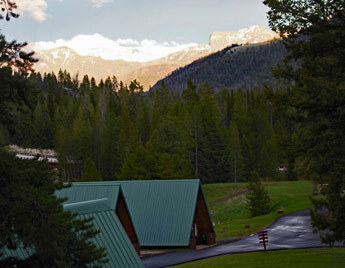 Our remote mountain location leaves us without cell service or cable television, so you will not find TV's in our rooms. Limited satellite internet access is available near our main lodge. All of our rooms are designated non-smoking. Our 2 queen and 1Queen/1 Twin rooms can facilitate a rollaway bed if booked with the reservation. Our 1 Queen Bed Standards are small single efficiency rooms arranged four rooms to a cabin with a queen bed and a private modern bathroom with shower. Our 1 Queen Bed Suite is a private two-room cabin. There is a queen bed in the bedroom and a sofa in the front room, and fully accessible bathroom with shower and a small porch. 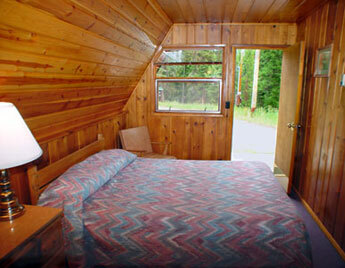 Our 2 Queen Bed rooms are located in duplex a-frame cabins arranged back to back. Each room has 2 queen beds, a modern bathroom with shower and a mountain view. The 1 King Bed Jacuzzi Tub units are located in our duplex honeymoon cabin. 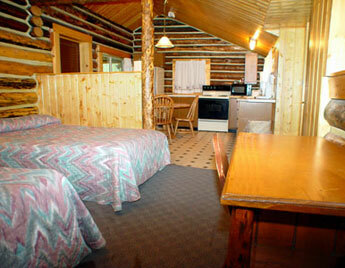 Many couples have spent special nights in this spacious cabin with king size beds, Jacuzzi tubs, and high log ceilings. The large porch makes a nice place to enjoy the spectacular mountain scenery while watching squirrels and other wildlife in the nearby woods. 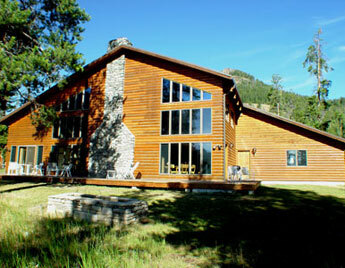 Located 1 hour west of Cody, Wyoming and just 2 miles outside Yellowstone National Park's East Entrance. Our 1 Queen Deluxe rooms are located in a front duplex cabin. These are larger single queen rooms with modern bathrooms, tub/showers and a shared porch. An adjoining door between the rooms can open to accommodate larger families. The Housekeeping Cabin has a full kitchen including dishes, pots and pans and utensils, a roll in fully accessible bathroom with a shower, two queen beds and a small porch. Our 2 Queen Standard rooms are located in log cabins, each with 2 queen beds, modern bathrooms with showers and tubs. 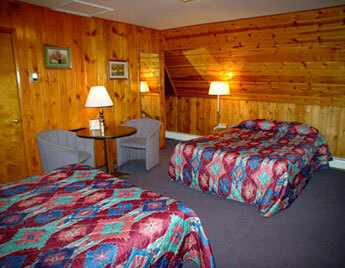 Our 1 Queen + 1 Twin rooms are located in log cabins, each with 2 queen beds, modern bathrooms with showers and tubs. Our 3 Queen Standard rooms are located on an upper floor. These 6 person units have 2+ bedrooms and one modern bathroom with a shower. Our 2 Queen + 2 Twin rooms are located on an upper floor. These 6 person units have 2+ bedrooms and one modern bathroom with a shower. Our large reunion lodge is a spacious two story modern house with fireplace, dish TV, full kitchen, Jacuzzi, and wet bar. The condo has 2 bedrooms with 4 queen beds. Five additional bedrooms are located in the outer wings of the condo, combining to make the Reunion Lodge (7 bedrooms/11 Queen beds and 8 full bathrooms). The Reunion Lodge makes a great base for larger groups, weddings or corporate retreats. 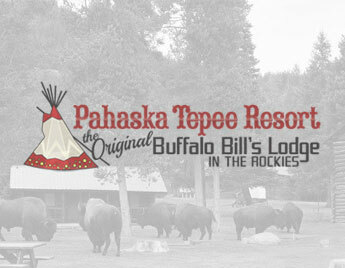 More info about Reunions, Weddings & Retreats at Pahaska Tepee, click here! Available year 'round | Located 1 hour west of Cody, Wyoming and just 2 miles outside Yellowstone National Park's East Entrance.